DocuSign is updating their product! You can learn more about this update by clicking here. 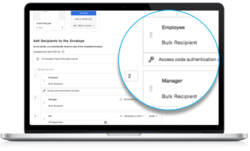 Bulk Send allows you to easily and powerfully send hundreds of envelopes at once so you can save time and ensure compliance. And now you can include multiple recipients in each bulk envelope (e.g. an employee and their manager), use any recipient type (e.g. Needs to Sign, Receives a Copy, etc. ), and dynamic envelope custom fields to track bulk envelopes better. Bulk Send is included in Business Pro and above; these enhancements are live in Demo now and will be in Production in May. For more information, take a look at the Support guide. 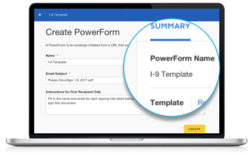 With PowerForms, you can generate on-demand, self-service documents for signature via a unique, secure URL ideal for use cases such as waivers, NDAs, and more. And now you can quickly compose PowerForms with step-by-step guidance, easily download the data from PowerForm responses, and manage or update the templates on which the PowerForms are based. PowerForms is available in Business Pro and above; these enhancements are live in Demo now and will be in Production in May. For more information, take a look at the Support guide. Delegated Administrative Permissions: We are empowering administrators to further control specific functionality and tasks their administrators have on their account with two delegated administrative permissions – Account Settings and Reporting. (Available in Business Pro and above in May). Auto-Activate User Memberships: We are adding the ability for organization administrators to automatically activate user memberships, removing the requirement for users to activate their accounts via email. (Available in the Access Management with SSO add-on and in Enterprise Pro in May). Support for California eNotary: We are expanding support of eNotary to include California (in addition to these nine states) to allow senders to request notarial acts and provide Notaries with the ability to host an in-person signing session within the U.S. (Available in Enterprise Pro in May). DocuSign for Salesforce CPQ: We are adding a Salesforce CPQ extension that enables DocuSign for Salesforce users to send with DocuSign directly from the Salesforce CPQ app, creating a seamless process for configuring, pricing, quoting, and collecting signature. (Available in the DocuSign for Salesforce Managed Package in May).